Gurmeet ‘Pinky’ an ex-Panjab police officer, has created shockwaves with his insider story of the way Panjab Police operated in the 90’s and still operates today. He has given detailed accounts of torture, cold blooded murder, bribery and theft and points the finger squarely, at senior officers for nurturing this culture of corruption at the highest levels. Gurmeet Pinky gives disturbing eyewitness accounts of the actions carried out by Sumedh Saini (former DGP of Panjab until October 2015). 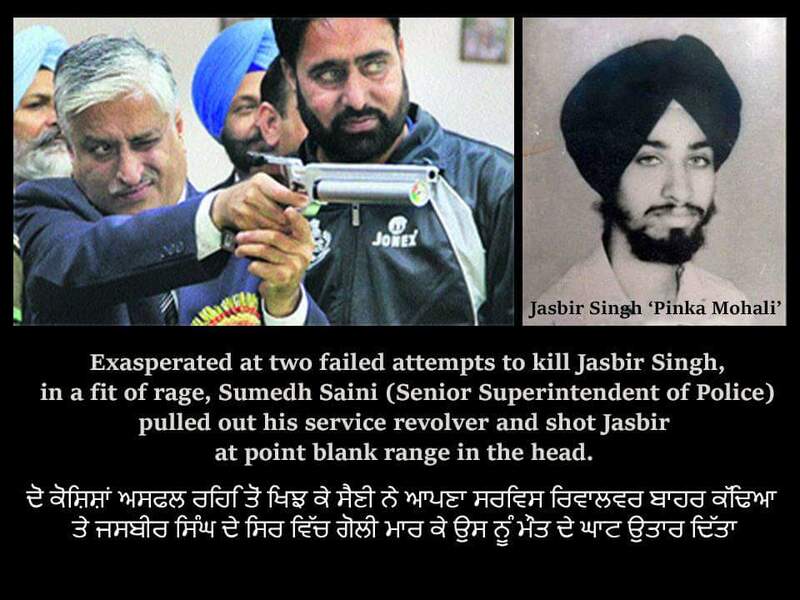 At the time, Sumedh Saini was SSP of Ludhiana which is also where Gurmeet Pinky was stationed. Saini was well-known to those in the Sikh struggle for his appetite to abduct, torture and kill Sikh boys in fake encounters. It was these actvities that led one outfit to target Saini in a bomb blast in which he suffered minor injuries. Gurmeet Pinky went to visit Saini while he recovered in hospital where Saini swore revenge against Balwinder Singh Jattana and Charanjit Singh Channa, whom he suspected had carried out the attack. Pinky, on Saini’s direct orders, went to Ludhiana to collect arms and men in order to perform whatever Saini had in mind, but while Pinky was on his errand, the notorious ‘Police Cat’ Phoola Nihang also visited Saini in hospital. Pinky only learned what Saini meant by ‘revenge’ when he heard the news that four members of Balwinder Singh Jattana’s family including a chid, had been killed in cold blood. A few years later Gurmeet ‘Pinky’ met up with Phoola Nihang in jail who confirmed that he had met Saini in hospital and he had ordered the execution of the Jattana family. Yet, this was not enough for Saini, Charanjit Singh Channa had a brother who worked as Head Constable in the Ropar district and according to Pinky, Saini had ordered him to be gunned down too. Pinky relates another story of Jasbir Singh alias ‘Pinka Mohali’, who had been picked up by police for routine questioning. As was normal practise, he was severely tortured on the orders of Saini, but when he could provide no information, Saini decided to kill him. First he ordered the use of a cyanide pill, this failed to kill Jasbir as it was a damaged capsule. Then Saini ordered he be force-fed pesticide, but this also failed to kill Jasbir. Exasperated at two failed attempts, Sumedh Saini pulled out his service revolver and shot Jasbir at point blank range in the head. Gurmeet Pinky tells of many more instances where the police picked up, tortured and killed Sikhs, stating he himself is witness to at least fifty murders. Those who regularly follow this SOPW page, will not be surprised by the evidence provided by Pinky, but it adds to the wealth of evidence against the Panjab police already available in the public domain. What is surprising, is how the Indian judiciary, media and investigative agencies, show no inclination to bring these corrupt officers to book. Anyone who has been charged with these crimes due to the sheer perseverance of affected families or human rights activists, has only ever been a low ranking police officer and those who are convicted continue to enjoy the same state salary which is paid throughout their sentence and beyond. Every effort is made to silence the officers so they do not implicate senior ranks and to this end, they are provided with the best legal representation money can buy, granted early parole and given monetary incentives from a secret slush fund maintained by the Panjab Police. There is no-one in the whole Indian justice system prepared to take on and bring to book those senior Panjab police officers with blood on their hands, some of whom are still wined and dined by the political elite, despite the wealth of evidence against them. Could it be, the Indian state has been fully aware all along of their illegal activities as it certainly provided vast financial funds to the Panjab police? Judges and central agencies have been compromised and the world is well aware that the Indian system lacks brave, honest and independently minded men or women. The silence from all quarters of India, shines a spotlight on the importance of the role our Sikh politicians should have played and be playing now. Neither Sukhbir Badal nor Captain Amrinder have given a response to the evidence released by Gurmeet Pinky, yet they are both wrestling each other to become the next Chief Minster of Panjab in 2017. They condemn the actions of Jagtar Singh H4wara and others, but never tackle the issue of why Sikh groups were forced to take such drastic action. Sukhbir Badal cosied up to Sumedh Saini and Captain Amrinder Singh reveres Beant as one of the greatest CM’s of Panjab. Neither Badal nor Amrinder have the qualities of a good Sikh, never mind about having the qualities to lead or represent the Sikh interest. It does not take a genius to understand that until the corrosive and corrupt elements of the Panjab police are rooted out and made to pay for their crimes, Panjab can not prosper. There has to be a movement that stands for JUSTICE and HUMAN RIGHTS. Breaking News :- Beadbi Of Pothi Sahib At Village Sarai Naga, District Mukatsar Sahib.